Recto, lower right, in brown ink: "A. Bloemaart"; verso, lower left, in brown ink: "Abraham bloemart de gorium. 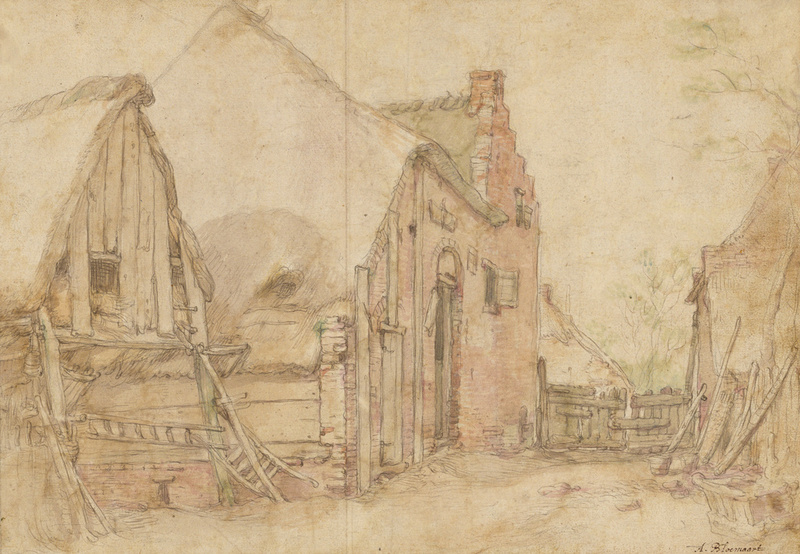 / 1564 - 1648"
Abraham Bloemaert drew the weathered boards, crumbling bricks, and sagging thatch in loving detail. A haphazardly repaired fence forms the focal point of the composition. His application of pink wash to the cottage walls gives the dilapidated farm courtyard an exceptional lyrical charm. Bloemaert most likely created this drawing as a study, possibly as part of a sketchbook. He painted primarily religious and mythological scenes, often with landscape backgrounds betraying his love of naturalistic subjects. 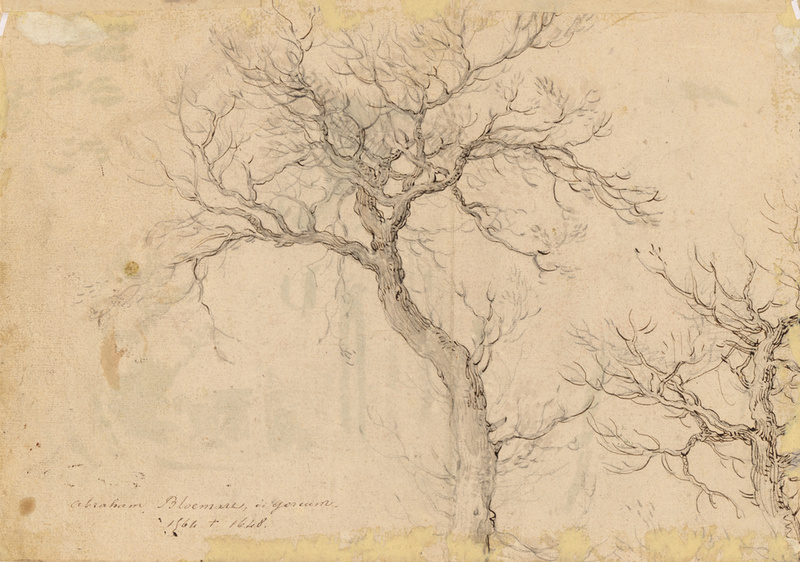 On the verso, or back, of this drawing is a sketch of an old, twisted tree. Its leafless branches reach out to cover the entire sheet. The sinuous curve of the trunk bisects the composition. Similar trees appear in other paintings and drawings by Bloemaert. Private Collection (the Lyon region, France), by inheritance to his heirs. Galerie de Bayser S.A., sold to the J. Paul Getty Museum, 2007. Bolten, Jaap. Abraham Bloemaert, c.1565-1651: The Drawings. 2 vols. (Leiden: Drukkerij Nautilus, 2007), vol. 1, p. 499, nos. a34-a35. Bolten, Jaap. Abraham Bloemaert, c.1565-1651: The Drawings. 2 vols. (Leiden: Drukkerij Nautilus, 2007), vol. 2, p.505, figs. a34-35.